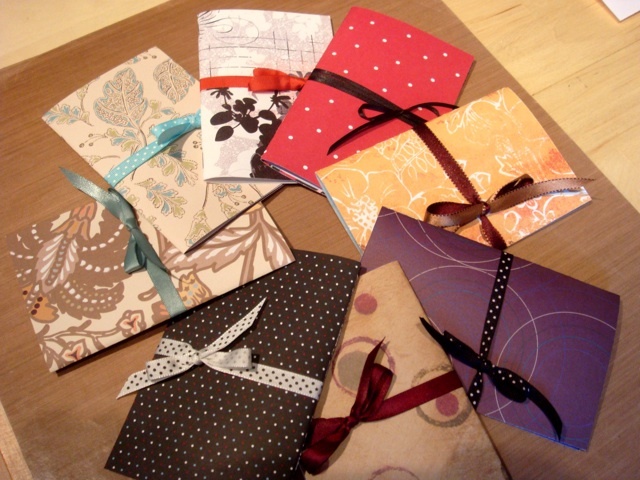 Feb 26 - Make a Notebook, using scraps! So my friend Avital totally gets credit for today's challenge. She posted a tutorial on her blog http://creativityprompt.com/. You need to go and check it out! I made myself one of these little beauties, in super-quick time! I couldn't believe it. Before I was started I was done, lol. So, I got the idea to make several, at a time! For friends, or just to have on hand. They make cute, easy, quick simple gifts too. So I made several this am. Took no time at all. Made them production-style. Cut the cardstock, cut the inside (copy) papers, stapled ribbons, and bam, DONE! I will probably embellish later, when I decide whose getting which book, lol. That will definitely take longer than making them. Then I can hand them out:) Easy-Peasy! If you make one, or more, we'd LOVE to see them here:) So, get out those scraps, and cut and staple, and admire:) It's that easy. Go see the tutorial it's quick and the book is easy. And the best part is I used all scraps to make these, which gives me good reason to get into the 'good stuff', lol! 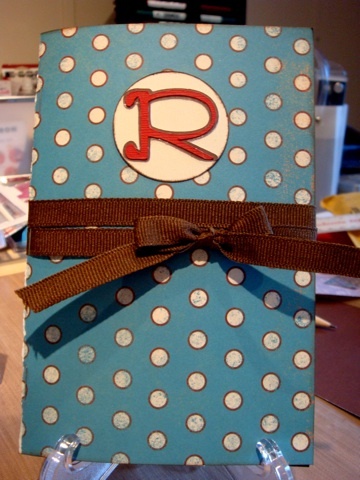 Re: Feb 26 - Make a Notebook, using scraps! GAve me an idea for a voucher pocket too!! What a quick and easy project Robin! I love using up scraps and these would be great to have on hand for small gifts! I like the idea of embellishing later...so I can personalize them! Robin, I clicked on your link but couldn't find that tutorial. The only one I saw used chipboard to make a mini book. The one you made just uses a stapled binding right? Ok, that should be the link to her tutorial! Sorry that didn't work. Her blog is www.creativityprompt.com. The tutorial is posted 1-2 weeks ago now, so you might have to scroll down if you get to the site, but not the direct tutorial link. She has a great site, enjoy! 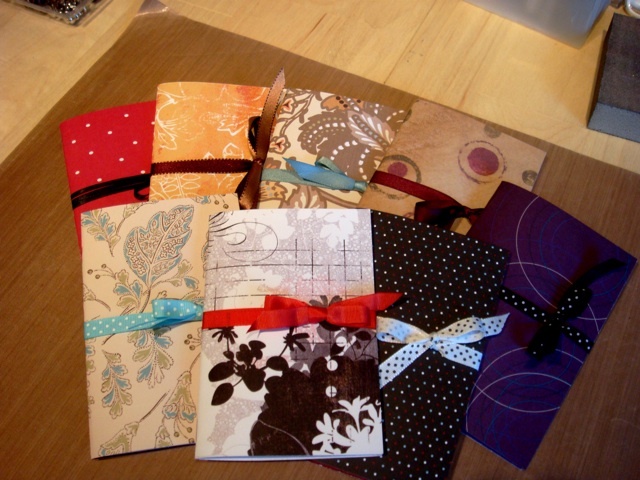 The notebooks are made of cardstock, cut to be a cover, from scraps. The inside is just copy paper, cut to fit inside. Ribbon stapled to the middle, outside, to close it up! Easy-Peasy! If you make on, we want to see it here!! I just clicked on the link above, and it went to her tutorial. Hope it works for you!